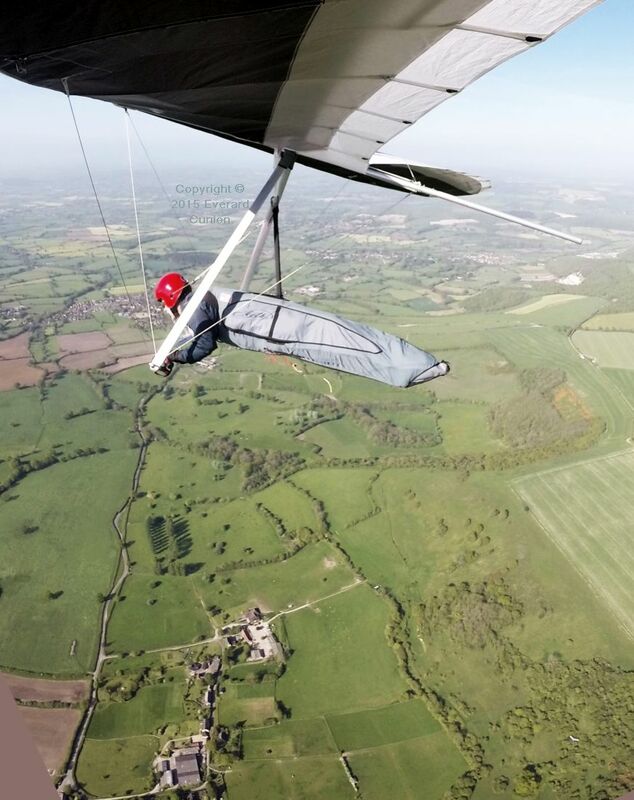 This page continues from Hang gliding 2014 part 2. 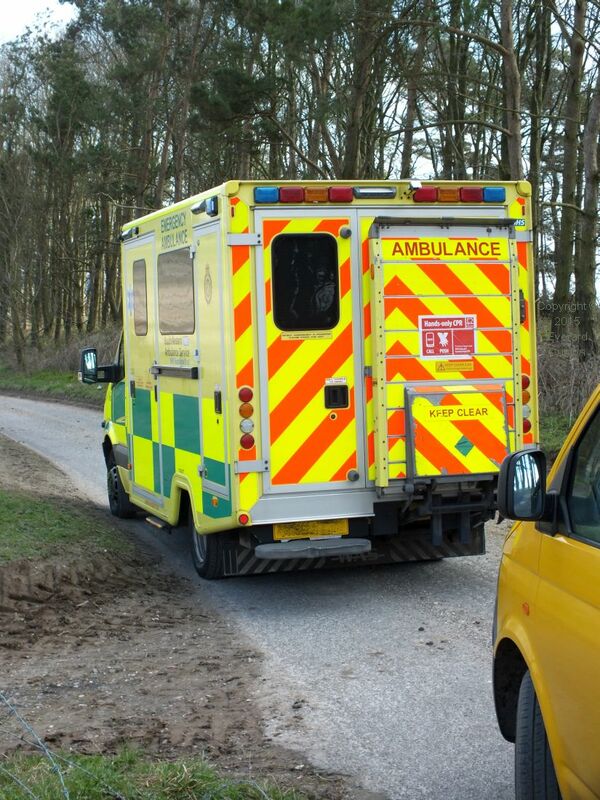 The year started badly with a serious paragliding injury at Monk’s Down. 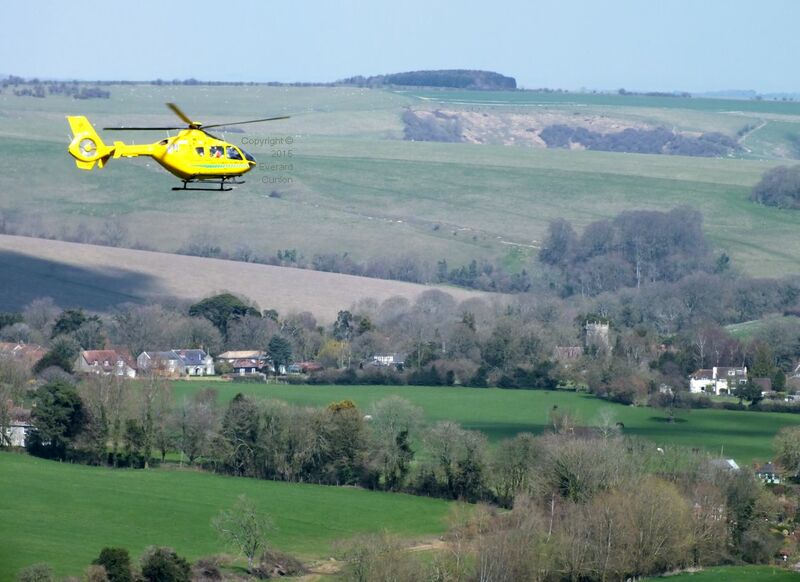 Ironically, the previous weekend, three club members (including me) acted as volunteer fence marshals at a horse racing event, which raised money for this very helicopter (or, to be more accurate, to go towards replacing it with a more capable one). 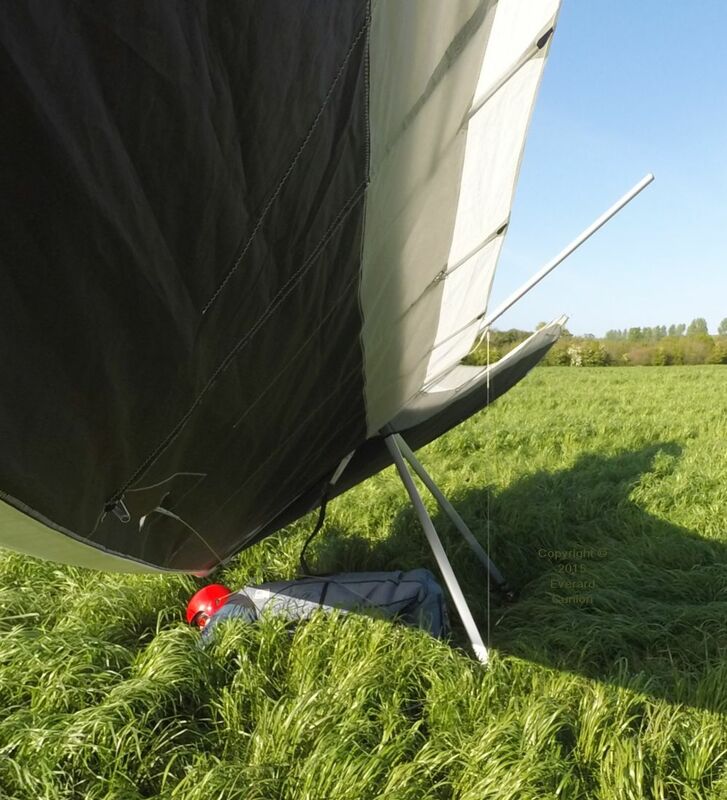 That is somebody else’s paraglider (wing and harness) balled up on the grass, not the accident victim’s. 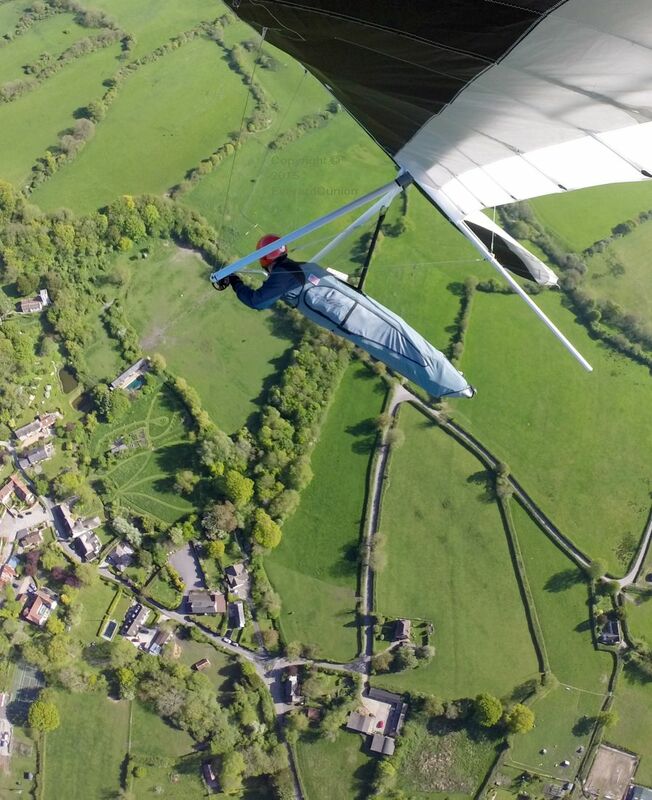 Nevertheless, some others flew after the medevac helo departed, including Richard M, who has a new sail for his ATOS rigid hang glider. 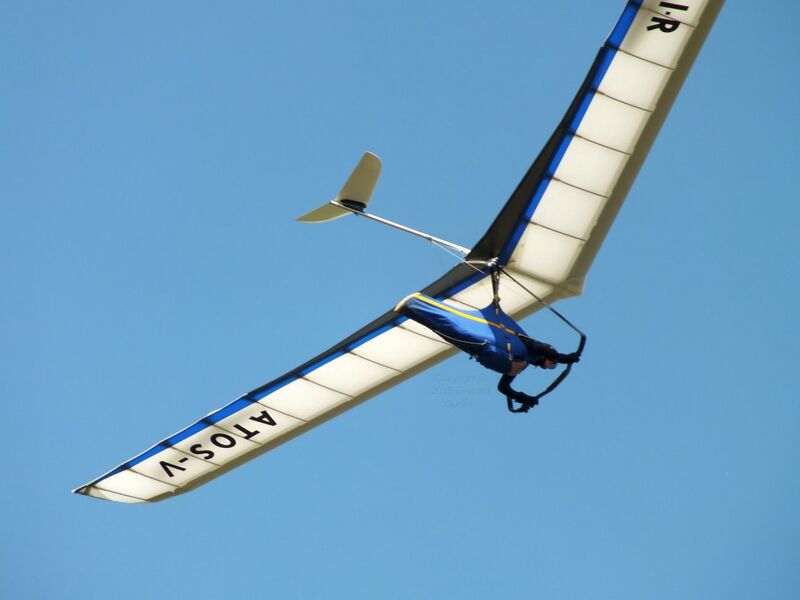 Rigid hang gliders use aerodynamic controls (ailerons or spoilers) for roll control rather than weight shift. They have more performance than flexwing hang gliders and paragliders. This was a windy day at Bell Hill in mid-May. I flew for just over an hour (I rarely fly for that long) gaining about 1,600 ft above take-off several times in large but weak thermals. In the photo at right, another hang glider is soaring low (it looks low from here anyway) on the north (wooded) half of the hill. With the top landing field unusable (the new farmer installed pigs and electric fences) tractors then started working in the main bottom landing field, so we nearly all (four out of five) landed in the adjacent field; a swamp with small power lines across the approach. I think everybody at least nosed over, but there were no injuries and only one broken glider. The wind was strong and off to the west the next day at Ringstead. 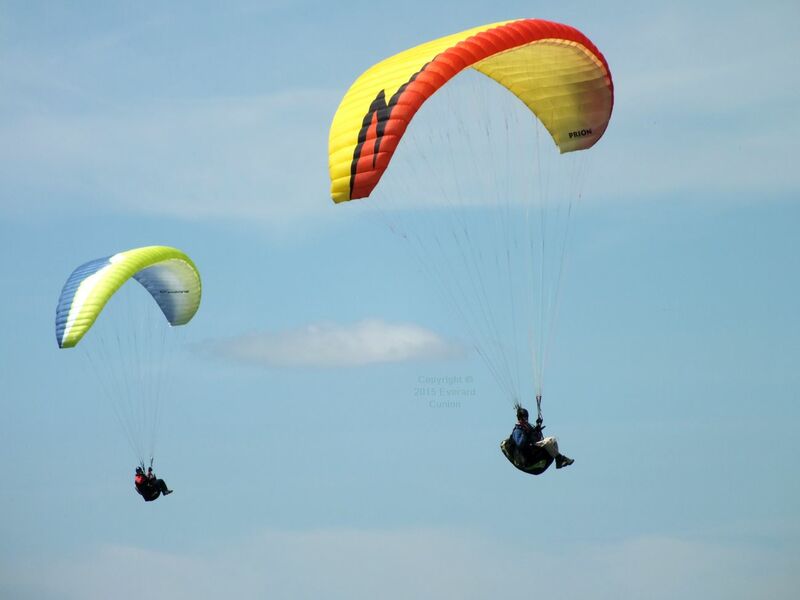 A couple of paragliders had good height above the cliff and, after they landed and we obtained a briefing on conditions from them, the hangies took to the sky. This seemed something of an Avian Rio event, the only other make of hang glider there being my Lockheed Wills Wing U-2. In this kind of lift, I am never able to get as high as the Rio 2s. 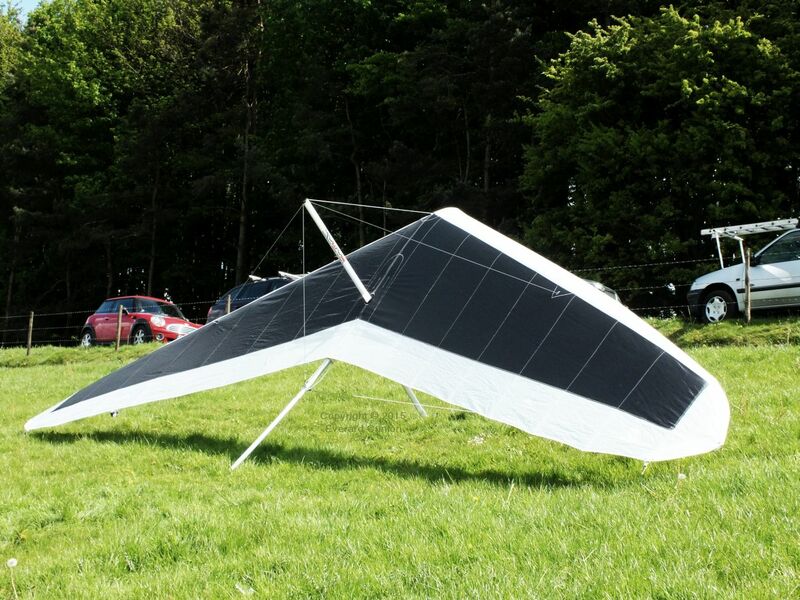 Even an older Rio 1, flown by Jon Howes, was a hundred feet or so above me most of the time. To be fair, I am fairly heavy in the U-2 (deliberately so — I like it that way) and for my kind of flying (thermaling) it has an unbeatable blend of performance and handling. 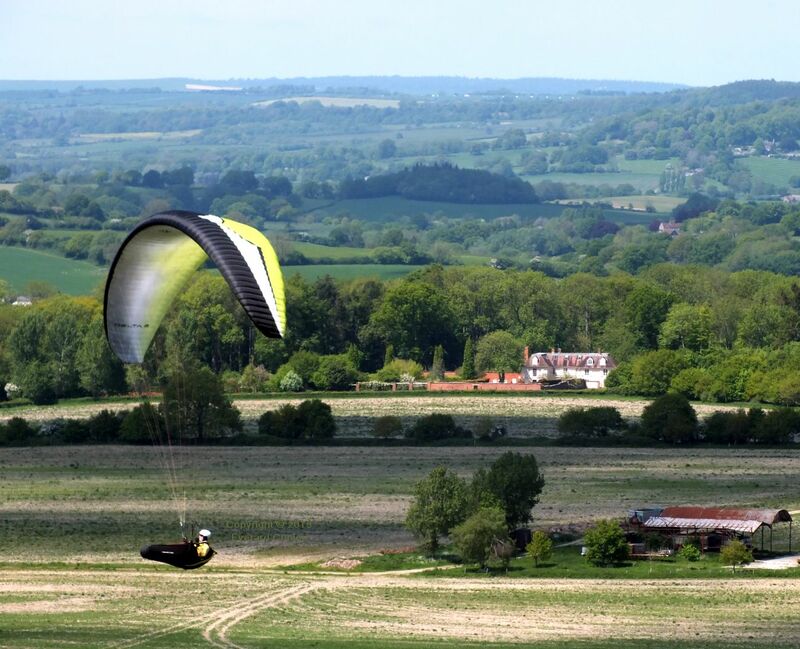 I once read about a boy who lived in the farmhouse at the base of the take-off ridge at Ringstead and who grew up, moved away, and became a competition hang glider pilot. Over the years I have mentioned the story to people who ask about the flying there. It does have a certain poetic appeal. 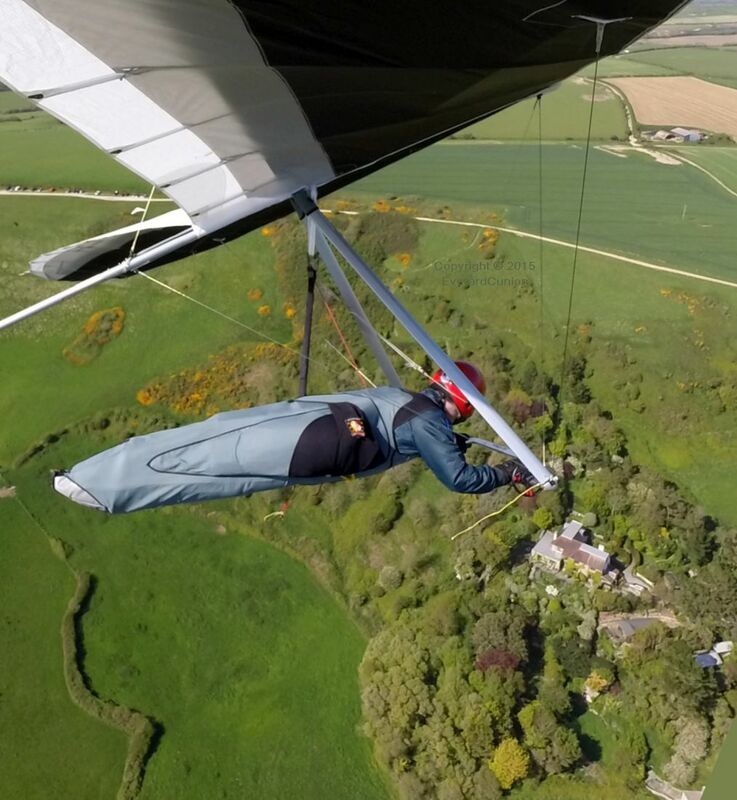 The last such occasion was the previous weekend: On a non flying day (as it turned out) I walked up from RAF Ringstead (the bottom landing field with its radar reporting room preserved from World War 2) with a hang glider pilot visiting from Australia. As we walked past that farmhouse I told that story. I had to admit that it was possible that I had imagined it. 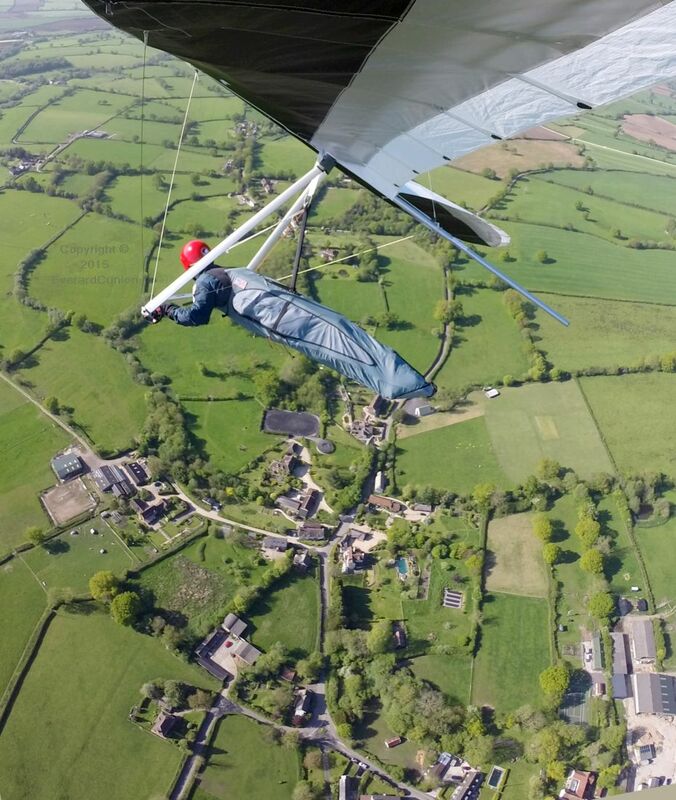 On a Saturday in late May 2015, a light and variable wind blew up, and sometimes across (when it blew at all) a tree-topped small ridge in north Dorset, England, called Monk’s Down. According to info I found on the web (not always reliable) it is named after a village clock maker named Monk. A country road runs along the top of Monk’s down; a narrow strip separating the grassy slope from the ridge of trees along the top. Very occasionally on a summer’s day, a loose and leisurely gaggle of burly fellows cycles along that road. In the middle of them, also on a bike, is an attractive woman. American singer Madonna has a residence a little way behind Monk’s down. Madonna and Kylie are approximately the same generation and they are often compared and contrasted. Paragliders excel in such conditions and, although I rigged my hang glider, I did not get to fly it this time. 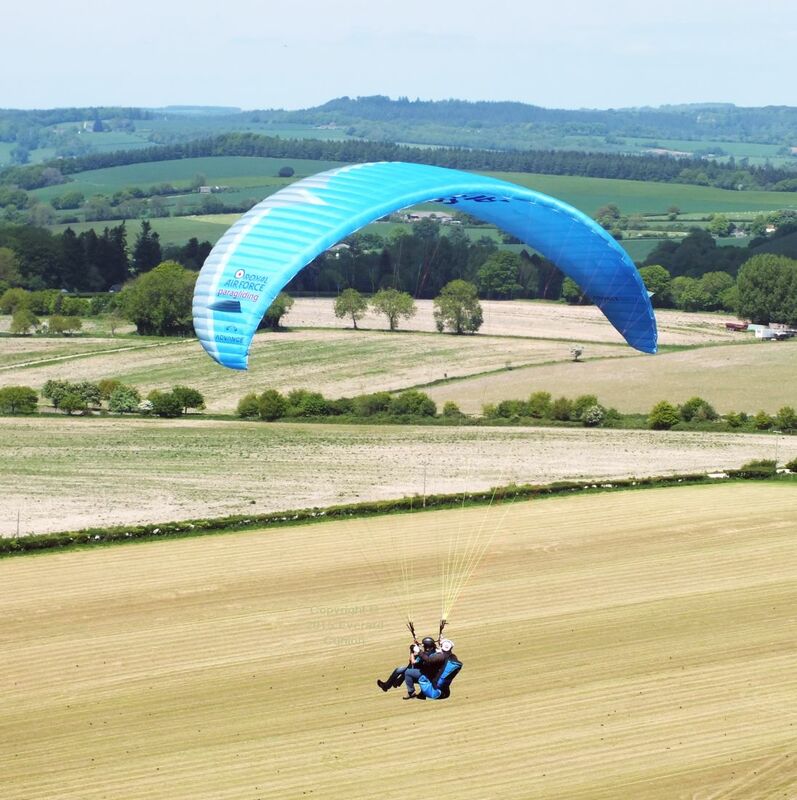 The RAF supplies its paraglider pilots with top equipment all finished in RAF colours. 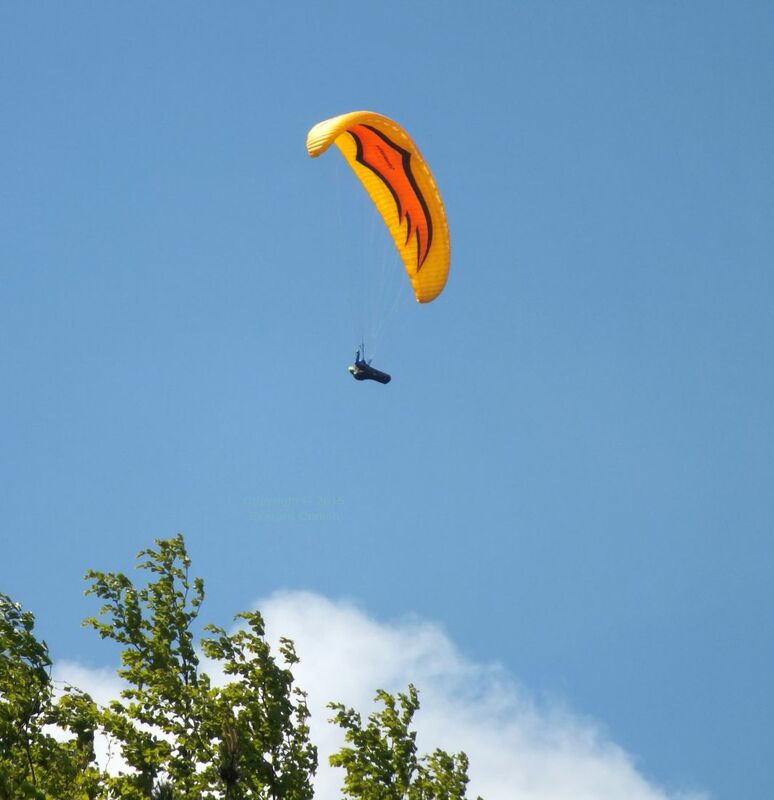 Hang gliders, which land faster than paragliders, are not as well suited to these conditions as are paragliders.